I think we can all agree that professional boxers are in great shape. If you aren’t so sure, put on some gloves and hop in a ring for 3 minutes while someone throws punches at your head and then get back to me. Now before you all go out and buy a mouthpiece and gloves, it’s important to understand that the majority of you reading this are not professional athletes preparing for your next bout. Most of us commute to the office every day, work at desks, have weekly meetings, etc. While we can certainly do some boxing-specific training in our routine, we must keep the big picture in mind and train for our health & fitness first. Injury prevention: Do no harm. Rule #1 always. Mobile and stable: Move well, then move often. 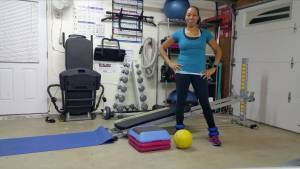 Personal – weight-loss, strength gains, upcoming event (wedding), etc. Skill-specific – Here’s where we incorporate the “fun stuff” specific to the sport. If boxing-specific training interests you and it aligns with your goals, let’s go through a fun yet challenging Total Gym boxing workout. There will be movements to help “injury-proof” the shoulders, improve rotational power and stability, and increase overall strength. 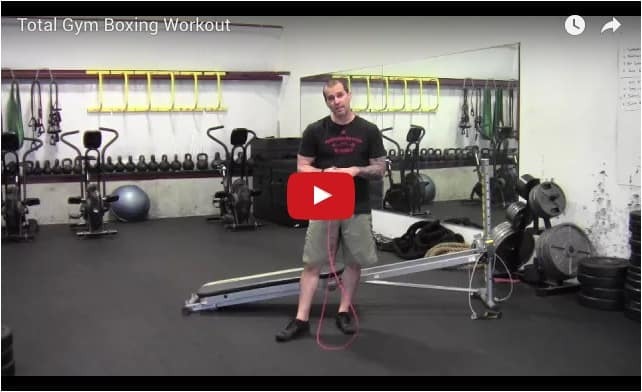 Incorporating some jump rope training into the mix is a great way to target boxing-specific muscles. Forearms, shoulders, and learning to bounce lightly and quickly off the balls of the feet are all imperative for boxing. Before getting into the workout, let’s answer the important question, “why”? Meaning, why are we doing the exercises listed? Do the movements help increase your strength? Do they help prevent injury? Do they get you closer to your goals? As long as they do then you’re good to go. Side note – If you’re interested in actually strapping on some gloves and learning the art of boxing, reach out to a local boxing club in your area. Improper form and technique could lead to injuries so it’s always best to learn from a qualified professional. Treat these as two 4-movements circuits. For the ‘A’ group, you’ll complete the first movement, then move on to the second movement, then the third, etc. Once you complete all four exercises, go back and complete the first movement to begin set #2. Complete 2 sets to start and as you get more experienced, you can work up to 3-4 sets of each circuit. Time yourself every time you complete the circuit so you can challenge yourself and track your progress. Why? Improves overall shoulder health and rotator cuff strength. Why? Improves rotary power and core stability & strength. Why? Strengthens legs and improves your shoulder endurance. Why? Improve timing & coordination as well as strengthening the wrists, forearms, and calves. Why? Improve shoulder health, namely cuff and deltoid muscles. Why? 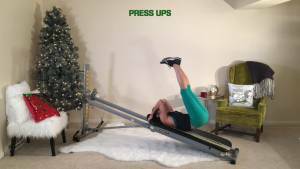 Improves rotary stability as well as chest, triceps, and shoulder strength. Why? Strengthen core and grip. “Iron Village Strength & Conditioning”. He was the head strength and conditioning coach for the Alliance Training Center where he worked with many top professional MMA athletes. Visit www.DBStrength.com or www.IronVillageSC.com for more information. What’s the Real Age of Your Muscles?